Use slide layers to create interactions and branched scenarios in your Storyline 3 courses. Layers can display additional content on a slide at certain points on the timeline or in response to learners' actions. Just use triggers to define when they should appear and disappear. Click the New Layer icon (looks like a blank piece of paper) in the Slide Layers panel. Go to the Insert tab on the ribbon and click Slide Layer. You add content to layers just like slides, including animations and transitions. You also manage the timing and duration of layer objects in the same manner as slide objects—via the timeline. You can duplicate layers on the same slide or even copy them from one slide to another. To duplicate existing layers on the same slide, just select one or more layers in the Slide Layers panel and click the Duplicate Selected Layer icon (looks like two pieces of paper with a green arrow). Select one or more layers in the Slide Layers panel, then press Ctrl+C on your keyboard or right-click and choose Copy. Go to the slide where you want the same layers to appear, then press Ctrl+V on your keyboard or right-click and choose Paste. Double-click the layer's name in the Slide Layers panel to open it for editing. You can customize the properties for each layer on a slide. Just select the layers you want to edit, then click the gear icon. 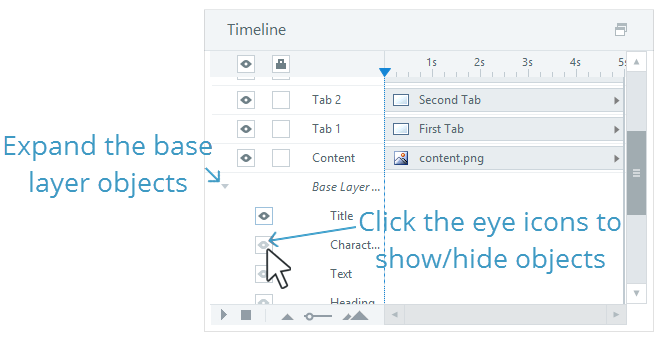 Tip: Storyline 3 lets you have the properties window open as you switch between layers, saving time and clicks. You can also set properties for multiple layers at the same time. Just Ctrl+Click or Shift+Click to select the layers you to edit. When the Slide Layer Properties window appears, make your choices (defined below) and click OK. This hides all other layers (except the base layer) when the current layer is visible to the learner. This hides everything on the slide's base layer when the current layer is visible to the learner. This hides the current layer when it has finished playing. If the base layer includes a seekbar, use this option to control how the seekbar affects the current layer. Select Yes to make the seekbar active for the layer. Select No to ignore the seekbar. It'll still be visible; it just won't affect the layer's playback. Select Automatically decide to let Storyline decide whether or not the seekbar will be active for the layer. Here's the logic: Seeking will be allowed if you mark Hide objects on base layer, Prevent the user from clicking on the base layer, or Pause timeline of base layer. Tip: If the seekbar is read only in your player properties, you won’t be able to drag the seekbar. In other words, the seekbar setting in your player overrides the layer-specific seekbar options described above. This prevents the learner from interacting with base layer objects, like buttons or drag items, while the current layer is visible. This pauses the base layer, including animations and audio, while the current layer is visible. The base layer's timeline will resume where it left off when the current layer is closed. Choose one of the following options to control how objects behave when learners revisit the layer. If the layer has only simple objects and/or audio but no interactivity, Storyline resets the layer to the beginning of its timeline. If the layer contains interactive elements, such as buttons or other objects that have a visited/selected state, Storyline resumes the layer where it left off previously. Use this option if you want the layer to always reset to its initial state. It'll restart from the beginning of its timeline, and interactive objects will return to their initial states. Use this option if you want the layer to always remember its previous state. In other words, this option lets learners pick up where they left off if they return to the same layer later. The layer properties described above provide an option to Hide objects on base layer, but it hides everything on the base layer. If you want to hide only some base layer objects, you can do that, too, since each layer has its own timeline. Here's how. Expand Base Layer Objects in the timeline. Click the eye icon for each object you want to hide. Tip: Hidden base layer objects will reappear when the layer is closed. To change the order of your layers, just drag and drop them where you want them in the Slide Layers panel. Layers display on top of the base layer (not behind it), and they'll open in the order in which they're triggered, regardless of their stacking order in the Slide Layers panel. Tip: To show more than one layer at the same time in your published output, click the gear icon for each layer to open its properties, then uncheck the box to Hide other slide layers. When you have multiple layers on a slide, you may find it useful to show or hide some of them while you're editing the slide. To display a layer even when it's not the active layer, click the eye icon to the right of its title in the Slide Layers panel to lock its visibility. To hide a layer, click the eye icon again to unlock its visibility. For example, if you don't want to see the base layer while you're building a supplemental layer, click the eye icon for the base layer to unlock its visibility—i.e., to hide it. The base layer visibility is locked by default. All other layers are unlocked by default. In other words, the base layer is always visible unless you hide it, and other layers are always hidden unless you make them visible. By default, only the layer that's currently selected (active) is full-color. All other layers are dimmed. If you'd prefer to see them all in full color, uncheck the Dim box at the bottom of the panel. To delete a layer, select it in the Slide Layers panel and click the trash bin icon (or just press the Delete key on your keyboard). You can delete multiple layers at the same time. Just Ctrl+Click or Shift+Click to select the layers you want to delete.